Welcome to our Student Showcase! I wanted to take this opportunity to share with you some of our students' stories and give you a chance to see how far the students have come in their writings. I hope you enjoy this section of our site. 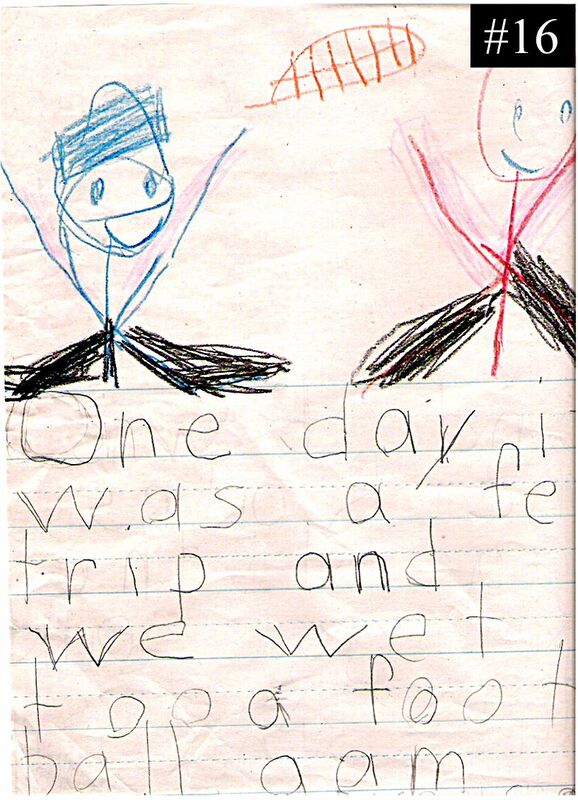 Every day we devote approximately 30 minutes of our school day to a time we call "Writer's Workshop." 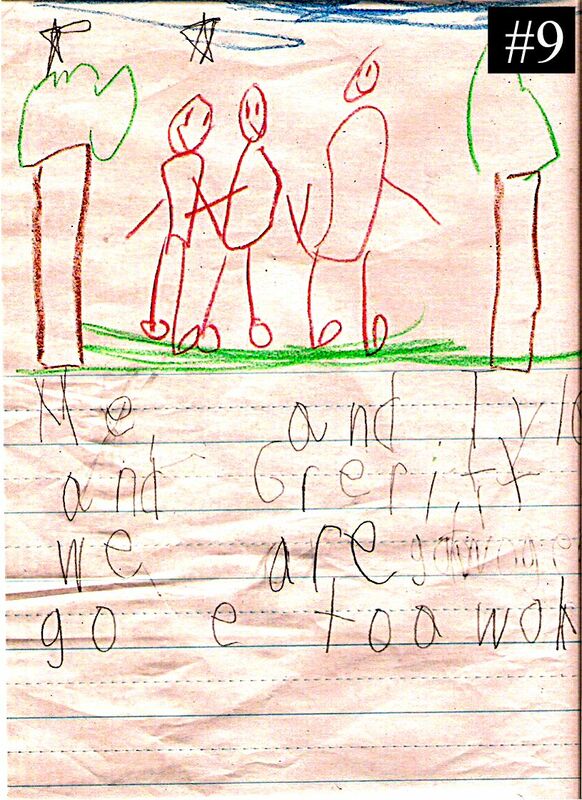 During this time, each child writes an original story. They receive no assistance from me. I want to see the stories they can create and read the words they can write on their own. 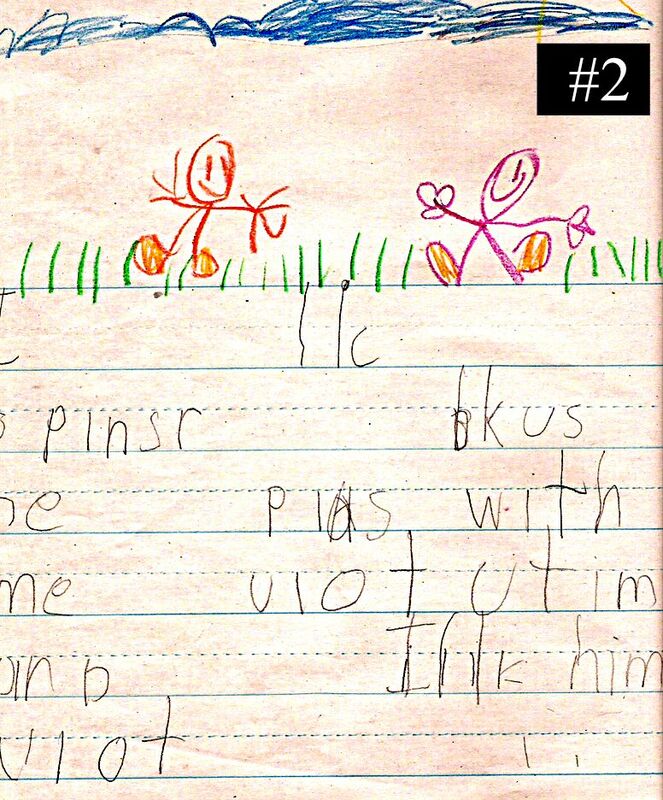 Seeing their inventive spellings and reading their original stories are some of the joys of being a kindergarten teacher. I can really see the progress the kids are making and how far they have all come during the year. 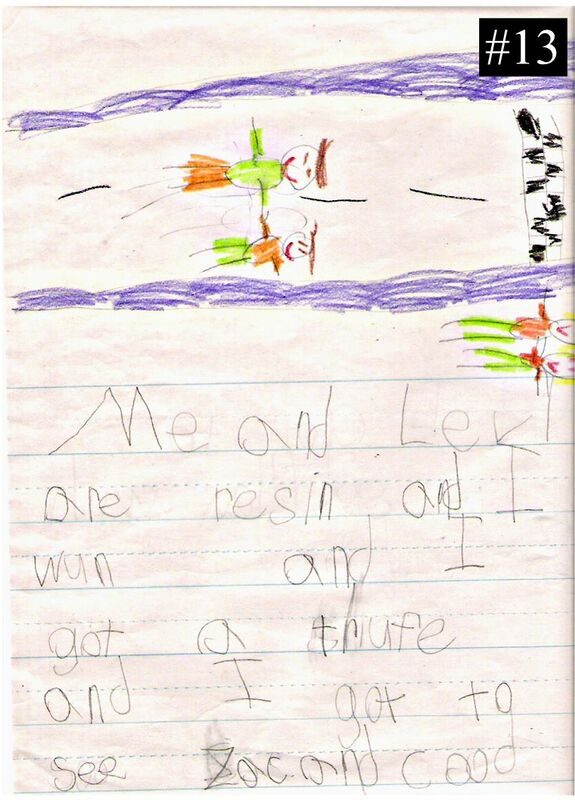 The sight words we have learned have helped the kids tremendously in their writings. 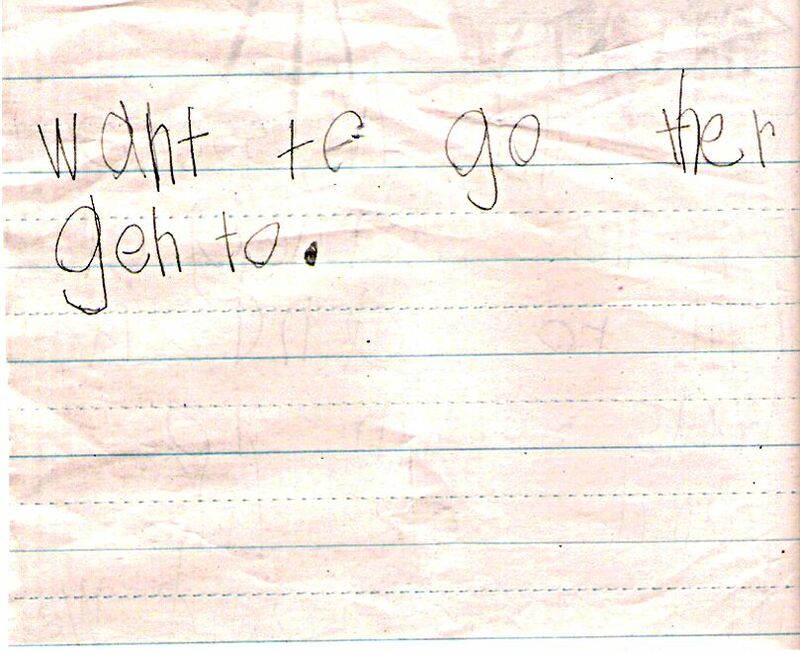 As you can also see, the kids are learning that sentences begin with capital letters and end with periods and question marks. 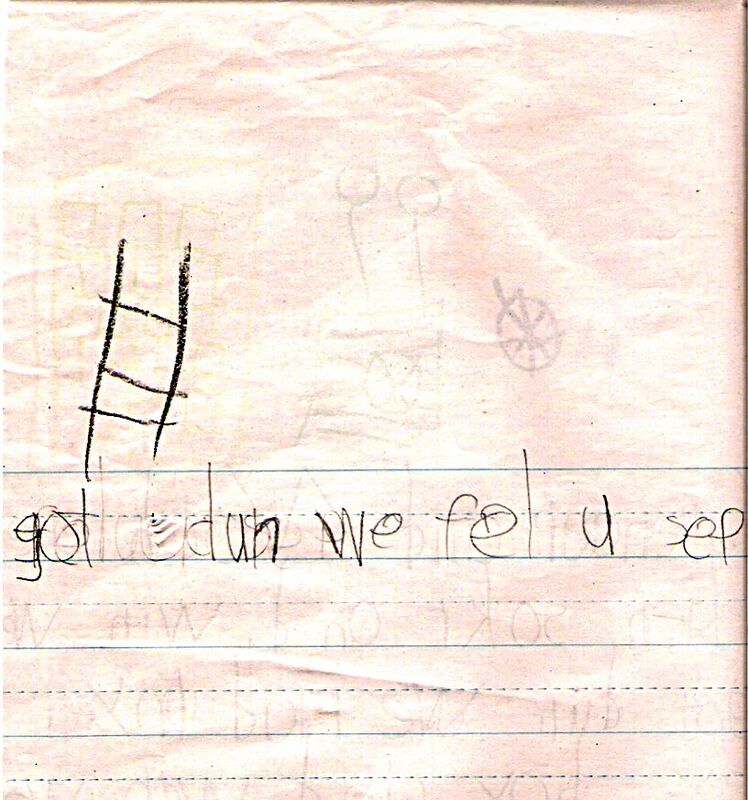 Of course, the grammar and sentence structure may not be exactly correct, but that's okay--we're kindergarteners!! In my opinion, these kids continue to surpass my expectations and they amaze me more and more each day. Take a look at some of the kids' works. 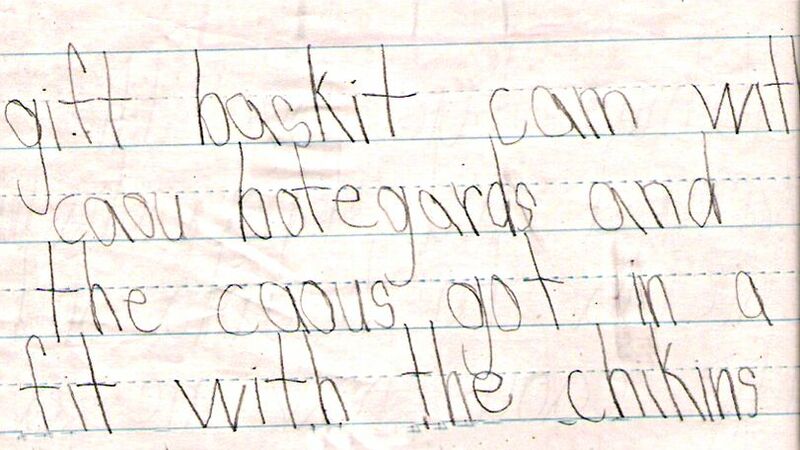 For privacy reasons, no names are on the papers, but if your child's writing is on here, I bet he or she could point out to you which one it is. HAPPY READING!! 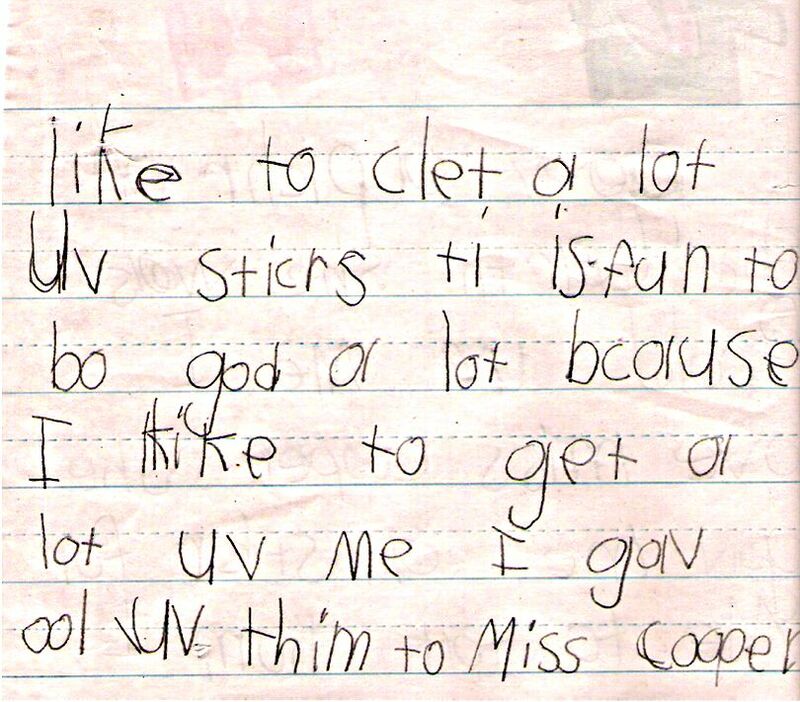 Student #1 wrote: "I love Miss Cooper and the school and the sun is in front of us." 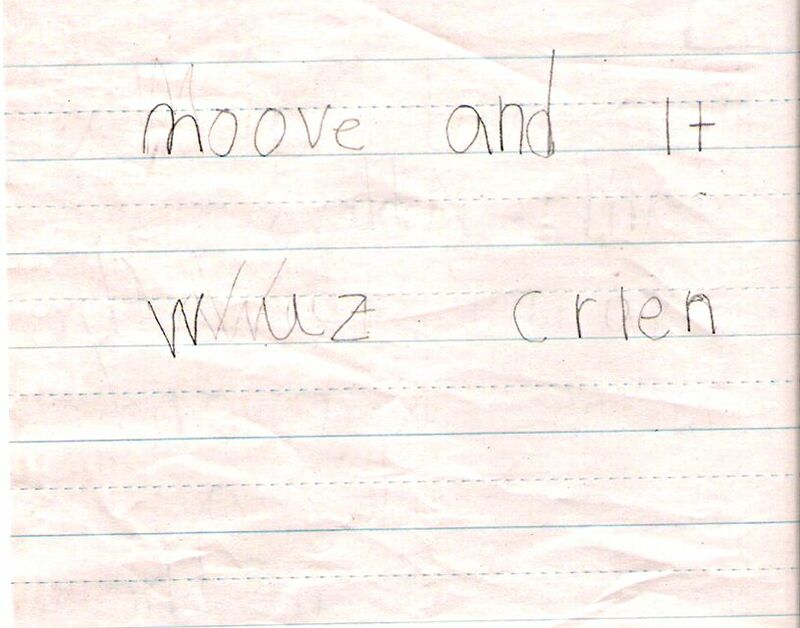 Student #2 wrote: "I like Spencer because he plays with me a lot of time and I like him a lot." 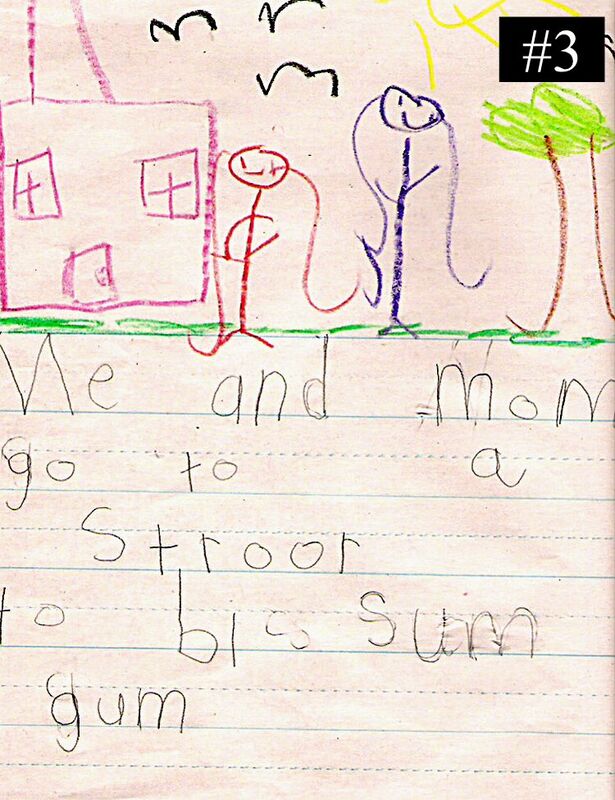 Student #3 wrote: "Me and Mom go to a store to by some gum." 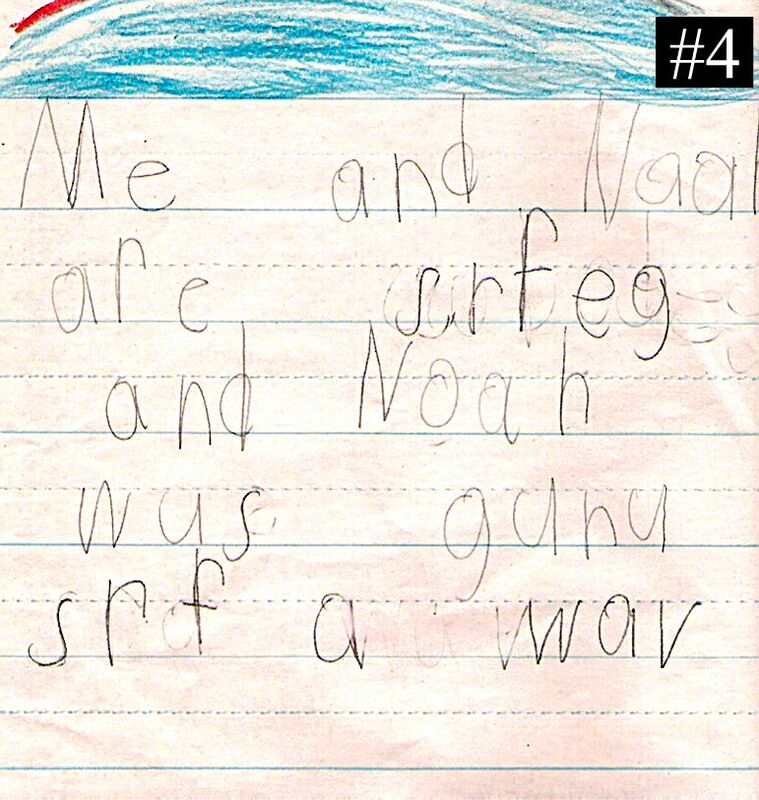 Student #4 wrote: "Me and Noah are surfing and Noah was gonna surf a wave." 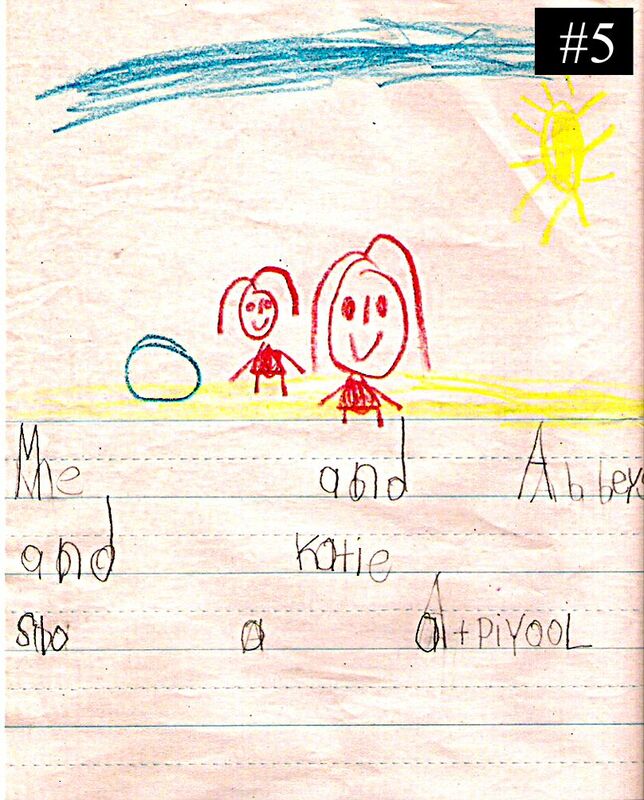 Student #5 wrote: "Me and Abbey S. and Katie saw a ant pile." 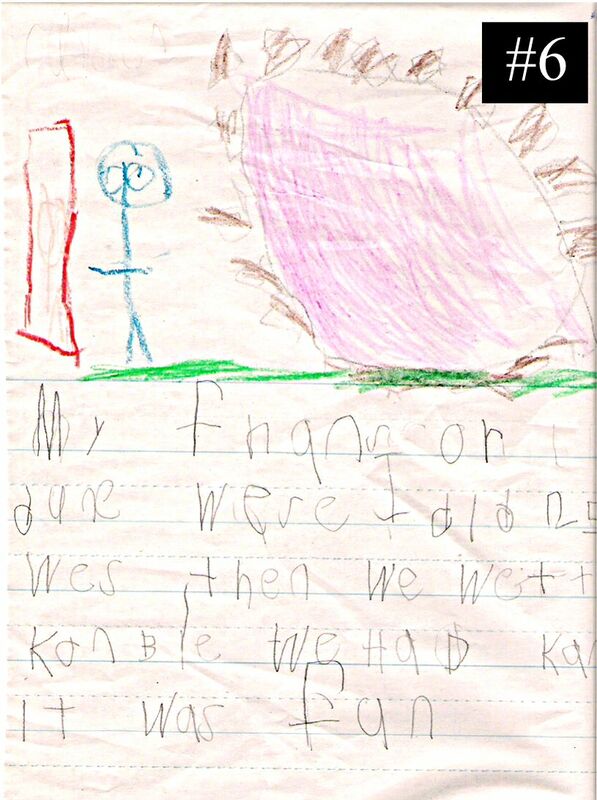 Student #6 wrote: "My friends are doing weights I did 25 weights then we went to carnival We had candy it was fun." 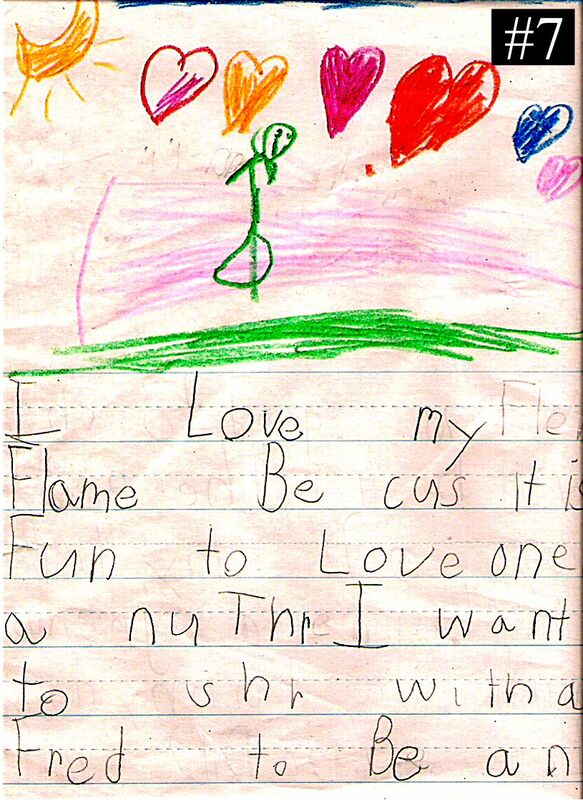 Student #7 wrote: "I love my family because it is fun to love one another. I want to share with a friend to be nice. 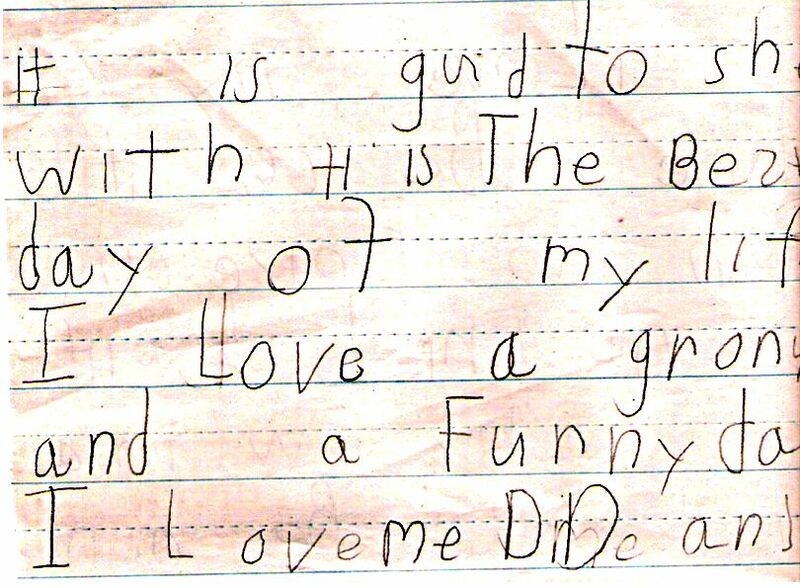 It is good to share with it is the best day of my life. I love a grown-up and a funny day. 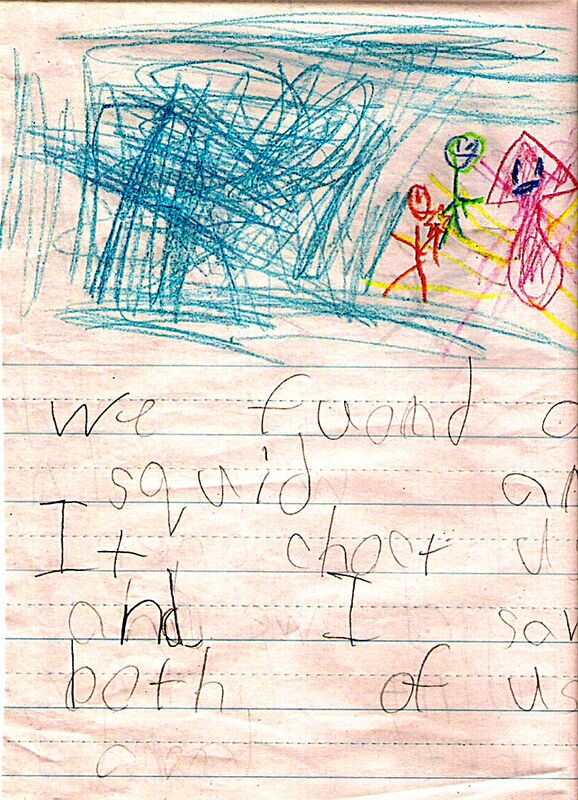 I love my Daddy and..."
Student #8 wrote: "Garrett and I went to the ocean and we didn't have to breathe and we found a squid . It shocked us and I saved both of us." 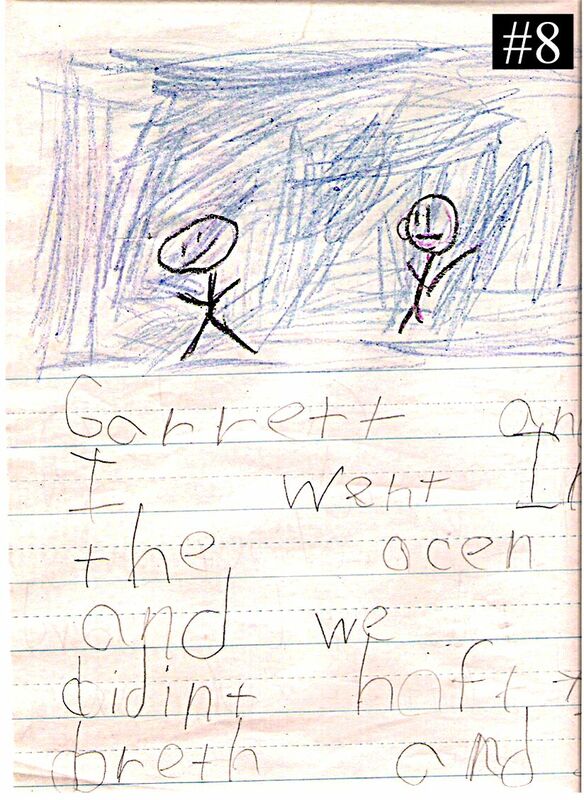 Student #9 wrote: "Me and Tyler and Garrett we are going to work." 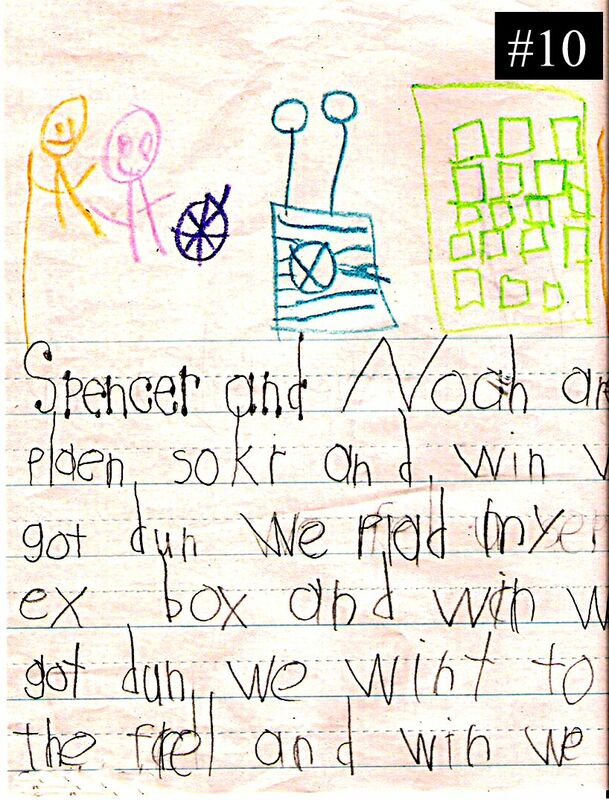 Student # 10 wrote: "Spencer and Noah are playing soccer and when we got done we played my X-Box and when we got done, we went to the field and when we got done we fell asleep." 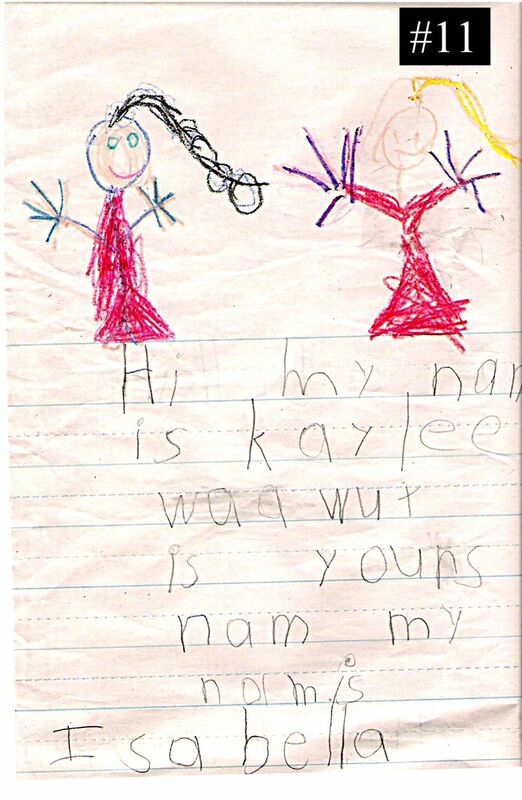 Student # 11 wrote: Hi my name is Kaylee what is yours name my name is Isabella." 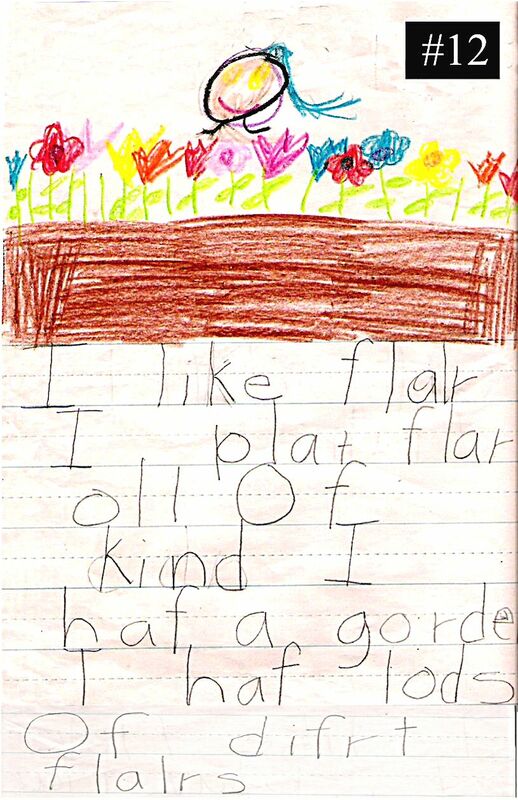 Student # 12 wrote: "I like flowers I plant flowers of all kind I have a garden I have loads of different flowers." 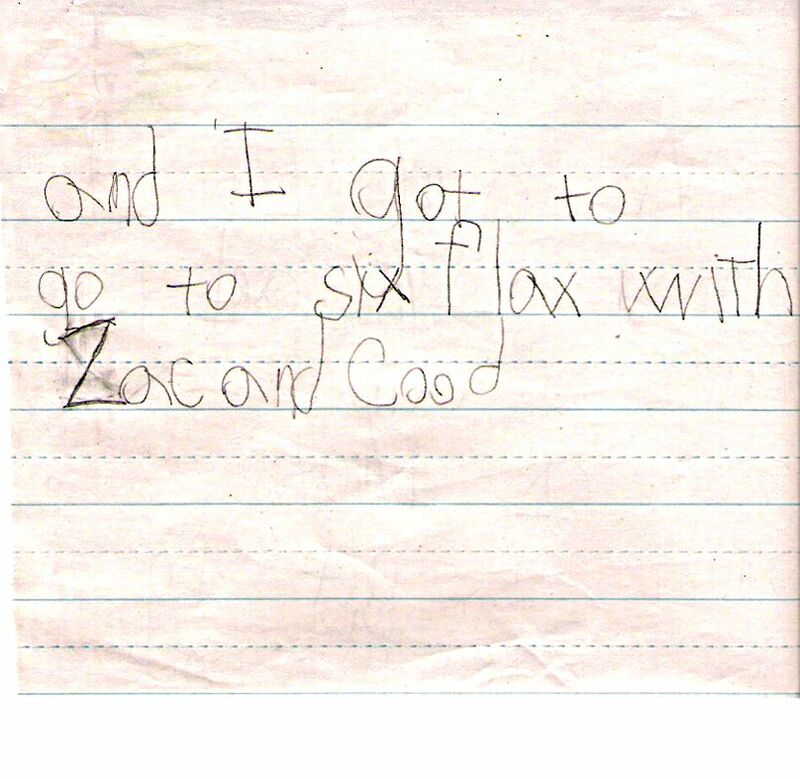 Student #13 wrote: "Me and Levi are wrestling and I won and I got a trophy and I got to see Zac and Cody and I got to go to Six Flags with Zac and Cody." 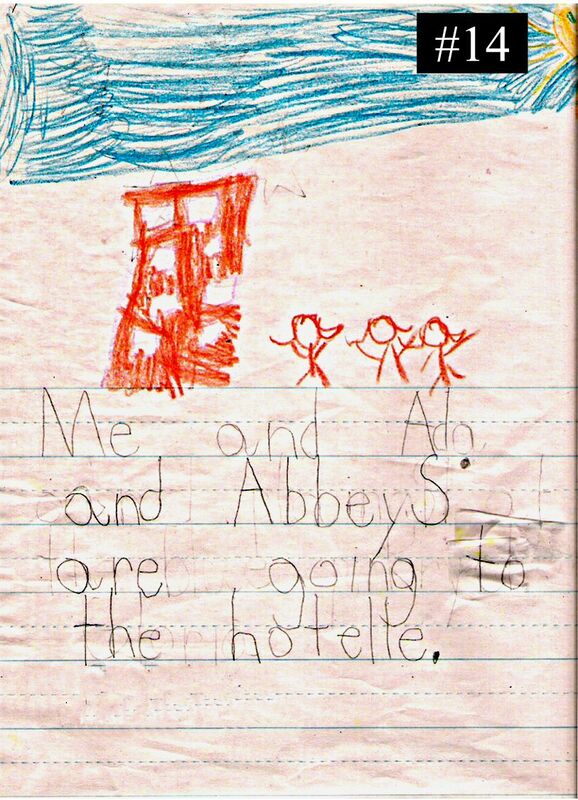 Student #14 wrote: "Me and Ada and Abbey S. are going to the hotel." 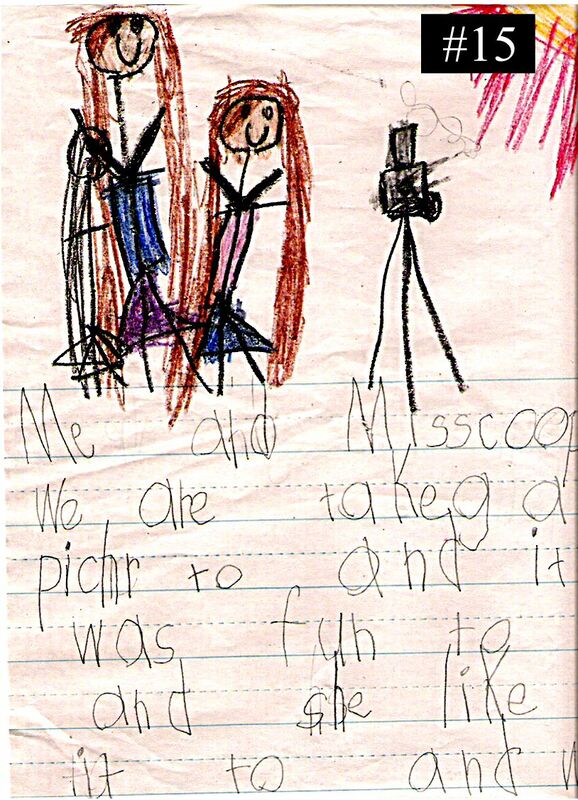 Student #15 wrote: "Me and Miss Cooper we are taking a picture to and it was fun to and she like it to and we want to go there again to." 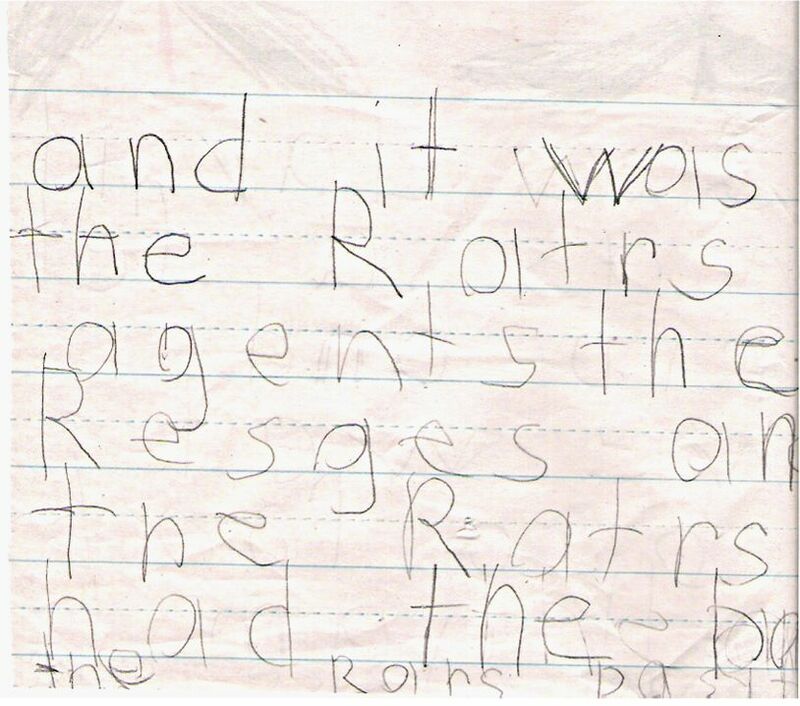 Student #16 wrote: "One day I was (on) a field trip and we went to a football game and it was the Raiders against the Redskins and the Raiders had the ball the Raiders passed it." 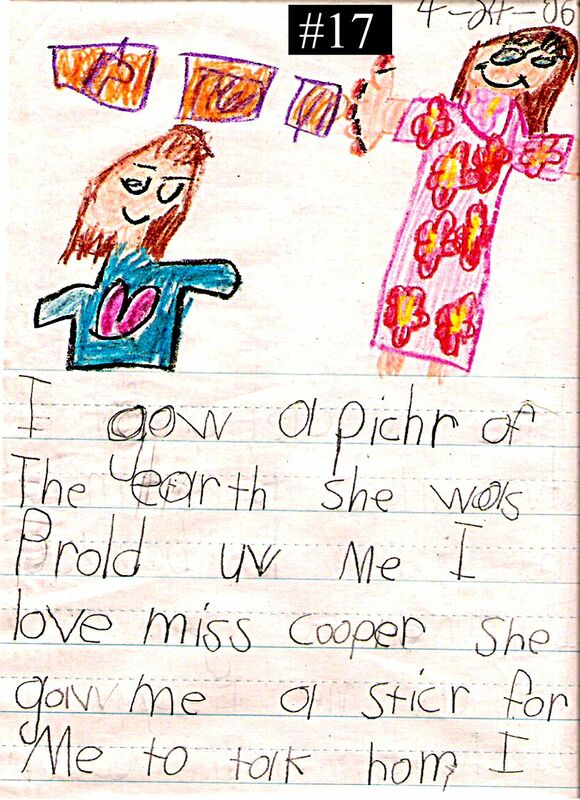 Student #17 wrote: "I drew a picture of the earth she was proud of me I love Miss Cooper She gave me a sticker for me to take home. I like to collect a lot of stickers it is fun to be good a lot because I like to get a lot of them. 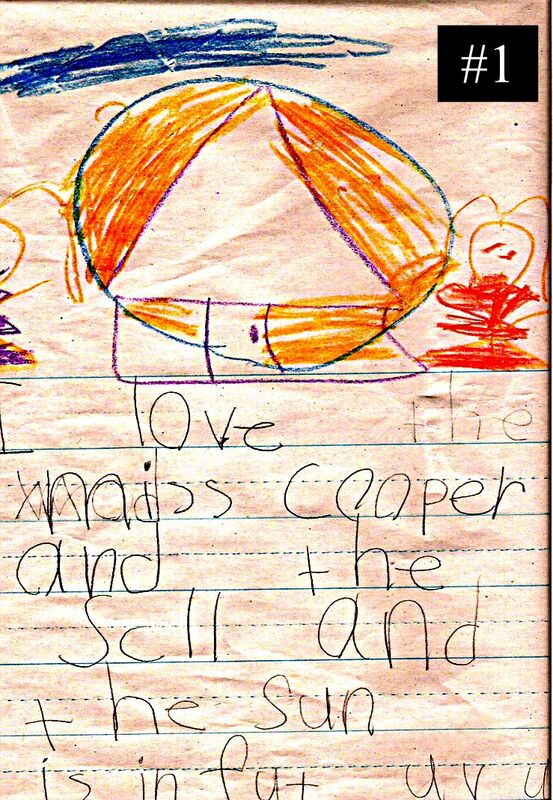 I gave all of them to Miss Cooper." 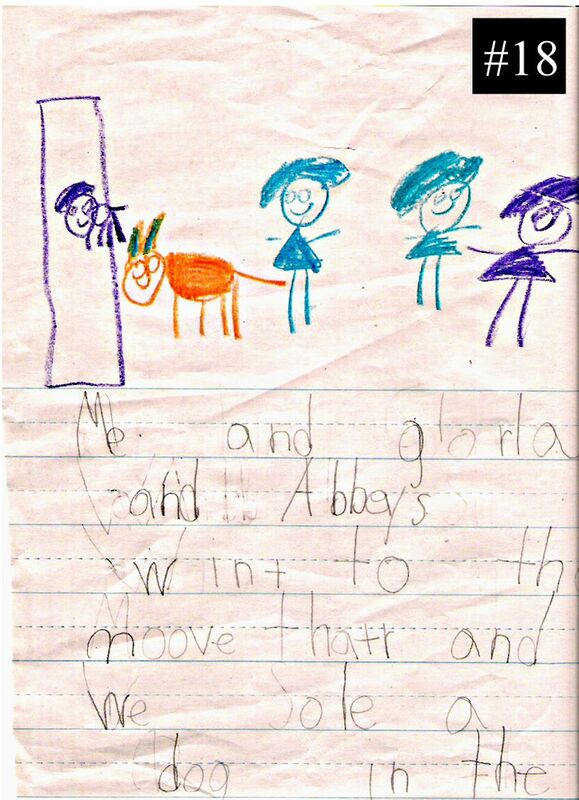 Student #18 wrote: "Me and Gloria and Abbey S went to the movie theater and we saw a dog in the movie and it was crying." 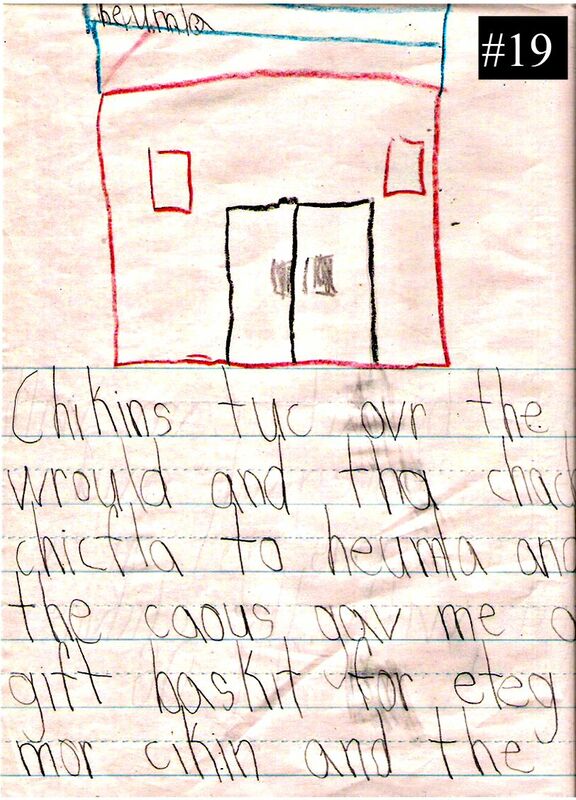 Student #19 wrote: "Chickens took over the world and they changed chick filet to hen filet and the cows gave me a gift basket for eating more chicken and the gift basket came with cow body guards and the cows got in a fight with the chickens."